Although most of the dog crates are treated as standard, there are indestructible models. They are different due to obvious reasons. They are stronger and more reliable than most of other, cheaper cages. If your dog is big and muscular, it is possible that he can destroy plastic cage or even bend the bars of a steel crate. These damages are sharp, and therefore dangerous for a dog and you at the same time. Some dogs behave like they were born as escape artists, if that is the case, you will definitely need a crate of this type. 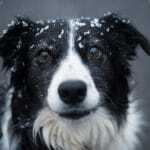 It is used to eliminate the risk of escaping while maintaining the safety of your pet. 1.1 What to look for while choosing an indestructible dog cage? 1.2 In what circumstances can I use it? 1.3 How to crate traine a dog? 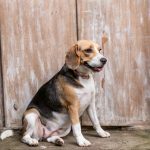 What to look for while choosing an indestructible dog cage? Heavy duty dog crates are a bit more complicated to choose than conventional ones. It means that you will have to take into account several factors. Size is a simple factor. Here the bigger is always better unless you will use it while traveling. In those circumstances, you need a crate which is only a bit bigger than your dog. 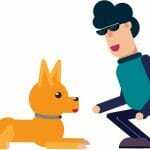 The bare minimum is 2-4 inches longer than the overall length of the dog (measuring from the nose to the tip of a tail), and 2-4 inches taller than your dog. 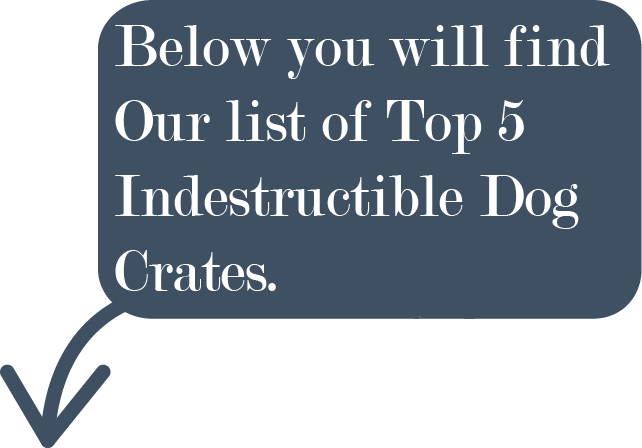 In any other case, the biggest crate is the best. Most of dog crates come with the wheels which are mandatory. Otherwise, you won’t be able to move it. There are some units without wheels, but they should be avoided. If you want to traviel with your dog, you should choose smaller units that are designed for this purpose. Another way to travel with a dog is buy the portable dog fence. It is perfect for camping and when you go to the countryside. This is the most demanding factor to consider. A heavy-duty crate for a dog must last as long as you need it and it must be extremely strong. Fortunately, there are crates in the market that meet these conditions. To make your choice easier we have reviewed models which are extremely durable and strong. Most crates are coated with a paint or a protective layer which makes them immune to the rust. Keep in mind that a crate will be exposed to the elements so a rust resistance is mandatory. Always check for units that come with some type of resistance. In addition, aluminum crates do not rust. How big and how is door placed? Make sure that your model has a large door which can be easily accessed by your dog at all times. Here must be mentioned that a door should be easy to open/close and that they are secured once closed. If you remember, we mentioned that these crates are developed for dogs who are escape artists. Units with a removable tray are the best. They can be easily cleaned within a matter of seconds. Those without a tray are a bit more complicated to clean. There are three common materials in this case. Steel crates are the heaviest and the strongest. They are reserved for large dogs who are aggressive and like to chew all the time. Aluminum crates are great for a bit smaller dogs who like to chew as well. They are lighter as well. Wood crates are traditional and they are less safe than other two versions, but they look the best. In what circumstances can I use it? A strong dog crate is mandatory when you two travel by plane. This is the only way you can travel with your dog. The second common purpose of having a crate is to allow a safe place for your dog, somewhere he can relax and feel secure. Small dogs love crates. The last, but not least, a dog crate is essential when your dog is in the same house with another, dangerous dog. The solid cage will keep him safe and sound at all times. 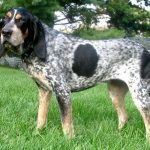 How to crate traine a dog? Each dog owner should know that teaching his dog how to crate is an important step in the life of you two. If done properly, a dog will start realizing that a crate is his safe haven, allowing you to get plenty of benefits. Keep in mind that this process must be done slowly and properly, without any mistakes. It is easy to present a cage for your pet as a dangerous place, so a dog won’t stay in it, regardless of how persistent you are. Once he is crate trained, you will get the benefits we will mention later. At the moment, it is mandatory to keep these points in mind. If you just close a dog in a crate, he will treat it like a prison, literally! This is the first and the most common mistake you must avoid at all cost. Always introduce the crate slowly and show to your pet that this is a safe place to be. Always make it comfortable and pleasant, by adding toys, blanket and of course, food. The first couple of times, you will have to feed your dog in a crate. This allows for him to relax and realize the indestructible dog crate is safe and a great place to be. Place his bowl at the end of a crate and allow him to eat as long as he wants. If he still feels scared, place food at the beginning of the crate and slowly move it backward. During this step, you will have to close a gate of an escape proof dog crate but only while he eats. Start with closing the gate slightly and increasing the closure over time. You should reach a level in which a dog is in the closed cage, but he doesn’t even realize. Then, you will notice that he will sit back and relax in it. 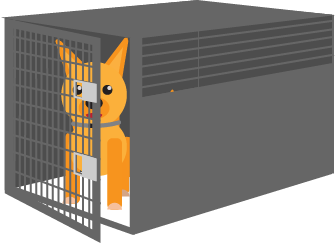 Once a dog is fully comfortable in his crate for 10-15 minutes, you can start prolonging the time. This is the easiest step of them all and almost all dogs won’t even realize that they are closed in a crate. Obviously, by now your dog is almost crate trained. Leave him closed in a crate and leave the room. Come after 1 hour, if he is fine, the process is done successfully. This is the best indestructible dog crate you can find at the moment. Reasons are simple. First of all, it is entirely made from steel tubes, so it is as safe and strong as it gets. Each tube is separately welded to the construction, therefore it cannot be broken or damaged. The size is 48 x 29 x 51 inches, but there is a 38-inch version as well, making it suitable for small dogs. Keep in mind that both of them are made in the same way, so they are safe, period. This is also one of the simplest to use crates. There are two openings, one on the side and another on the top. This makes it easier for dog owners to access their pets at any given moment. When it comes to cleaning, this crate is one of the best once again. There is a plastic tray in the package, allowing you to clean the cage easily and within a couple of minutes. Practicality is great due to the fact there are 4 wheels on the bottom of a crate. They allow you to move the crate easily and in any direction. Of course, steel crates are developed for home use, but this one is slightly better than similar models. Gates are additionally secured, so there won’t be any chances that your dog opens them accidentally. The model in question has been involved in several experiments with escape artist dogs and it passed them all. Overall, you get an excellent crate made from steel, which is durable, strong and reliable. 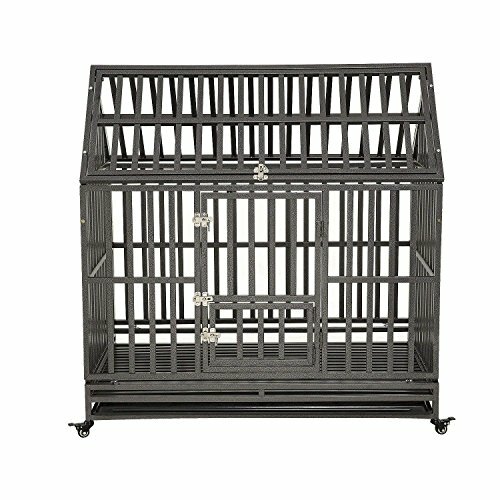 Here we have another steel crate for your dog which is already known for safety and reliability. The dimensions are 37 x 25.3 x 33.8 inches (M size) but there is L, a larger version available. 20-gauge steel bars are more than just safe and capable of withstanding anything your dog can throw at them. In addition, the crate looks well-made and the attention to details is above the average. We also liked the fact it comes with a gate which is extra-tough. 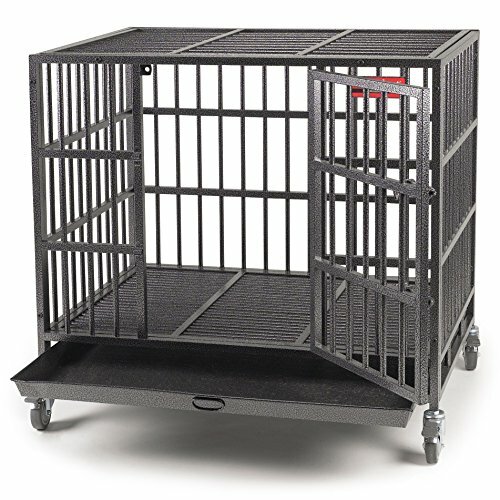 So, in a nutshell, you will get a strong and durable, steel crate for your dog. Wheels can be mounted at the bottom of the crate, which allows you to transport the crate easily, or they can be removed, if you need extra stability, it is up to you. This is an indestructible dog cage of the latest generation. It is so safe that even the most demanding dog owners had luck with it. You will probably be one of them as well. In addition, there is a removable grate with a tray. This makes cleaning much easier, as we have explained above. Overall, we have a string, steel dog crate which is developed for the most problematic dogs. It is still a dog-friendly and it is made with the help of the latest technologies. In general, the crate is made to last, therefore it is a wise investment. Just in a case you want a bigger one, L version is available at all times. The model in question offers affordable quality. It is rust resistant and it is made from steel. These crates are the most durable of them all and they can withstand almost anything. This one has dimensions of 42 x 31 x 37 inches, but it is available in a smaller size as well. What we liked especially is the gate. There are three of them, two at the front (for smaller and larger dogs) and one at the top. This made the unit extremely functional regardless of the dog size. When we are discussing simplicity, we should add that the assembly process takes just a few minutes. Basically, you have 4 screws to tighten and you are done. This durable dog crate may be the best value for money you can find at the moment. Cleaning won’t be an issue as well. There are 2 plastic trays beneath the crate, making this process more than just easy. Don’t expect to waste more than a couple of minutes on cleaning. In addition, wheels are included in the package, so you won’t have any issues with them. They cannot be removed, but they don’t affect the crate stability. The cage is developed for heavy-duty purposes, where you must have a high-quality cage, capable of meeting the toughest requirements. In essence, the most demanding dog owners will appreciate this cage and their dogs are going to love it. You get everything you need and at a low price. This is a bit different dog cage than other models on the list. First of all, it is made of aluminum and it is completely rust resistant. Even additional elements are made from stainless steel and rivets which are coat protected. In general, this cage can withstand all kinds of bad weather and circumstances and it will stay like new. Aluminum is .063, making the construction tough and strong. The dimensions are 35″L x 25″W x 29″H inches, making this a large crate. But, the manufacturer offers a smaller version as well. Basically, they are the same except the size and it is more affordable. Anyway, this version is developed for larger dogs, while smaller one is suitable for smaller breeds. The larger version can be used for dogs up to 100 pounds, who are up to 29 inches tall. 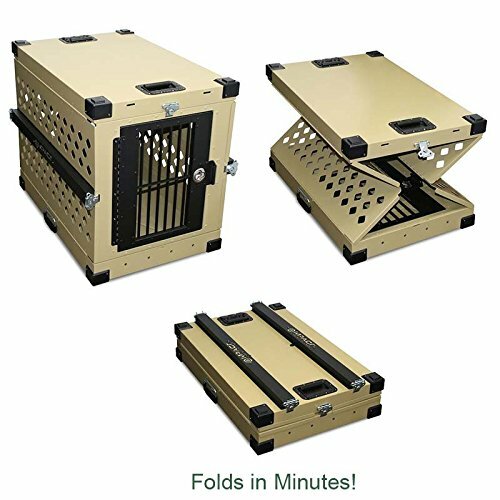 Both of them are foldable, making this the best, portable dog crate. They can be folded within seconds and they will make transport easier than ever. The folding design is an all-new and highly desirable feature. Additional facts you should know is that there are spring-activated handles, the accessories for usage on airports and ventilation on all 4 sides. The door will stay shut as long as you need them and it is impossible for a dog top to open them. 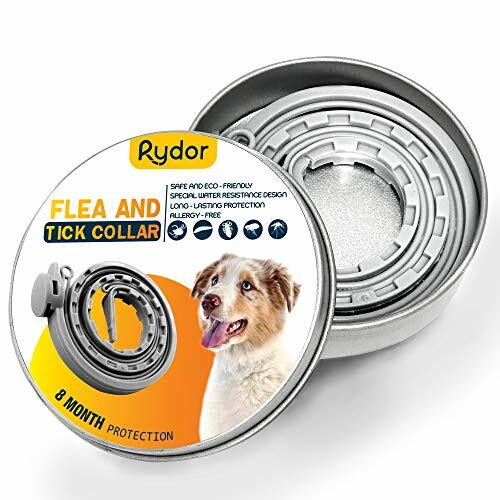 Even during the manufacturing process, the manufacturer didn’t use toxins, chemicals or anything else that may have a negative effect on the health of your dog. We liked feature as well. The indestructible dog cage made from aluminum sounds appealing. This one is capable of holding in even the most dangerous and the best escape artist dogs without an issue. What is the main advantage here is the weight. The cage has 38 x 34 x 30 inches dimensions, but it weighs only 43 pounds, almost 1/3 of equivalent steel cages. The size also made it suitable for larger dogs. Silver Hammerstone finish is standard, making the cage durable and scratch resistant. Obviously, aluminum doesn’t rust, so rust issues are not an issue. There are a few more advantages with this cage. First one is the gate. 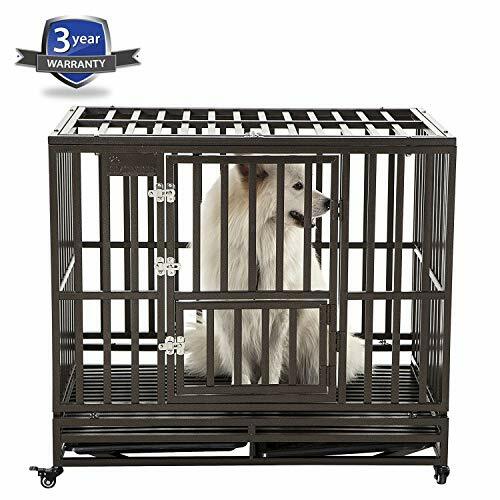 It comes with secure lock, which is the main reason why we would recommend this cage for owners whose dogs are escape artists. Ventilation is great as well. They have been implemented on all sides of a cage, making this model suitable for usages when the temperature is high. There are no complications with the build quality whatsoever and the manufacturer used the latest technologies in order to produce this cage. All of this made it appealing to dog owners who want the best and the most secure model for their pet. To summarize, the cage is a worthy investment. 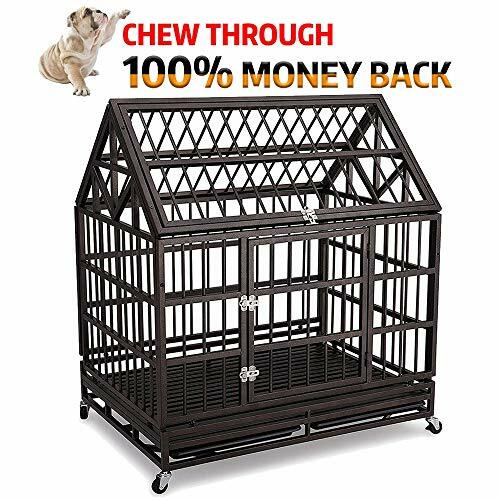 It is specifically developed for dogs who will destroy almost any other cage within a matter of days and it is capable of withstanding the pressure as long as you need it. Furthermore, the cage is safe for dogs of all breeds.